A really odd sensation is coming over me right now. I’ve just finished The Traitor Baru Cormorant and I’m sitting down to write this review, struggling to find the right words to describe my journey with this book. It all started even before I picked up the novel, since I’d been seeing so many of my fellow readers talk about it in the weeks leading up to its release, and quite frankly, a lot of the stuff I heard scared the hell out of me. Economic machinations? An accountant as the main protagonist? And oh will you look at that, there are even financial math metaphors in the book’s official publisher description. It was really not looking good at all. I love the idea of a geopolitical epic fantasy, but I personally have no interest in a game of ledgers and numbers. Stuff like that just doesn’t appeal to me, it just makes me want to run for the hills. But on the other hand, there are a lot of things that sounded good too. A tragic tale of revenge. Deep, multi-faceted characters. Immersive world-building and political intrigue. A thought provoking presentation of societal themes and issues like gender and sexuality. All this was enough to overcome my reservations, so in the end I just decided to take a leap of faith and simply let myself fall into this book, fully prepared to find myself broken and bloodied on the ground when I finish. Well, I’m done now. And the only thing broken and bleeding is my heart. What can I say, I was drawn to the main character Baru from the very first page. I loved the voice Seth Dickinson gave his young protagonist, who is only a little girl at the beginning of this story, watching her country of Taranoke become conquered by the Masquerade. Real world history is full of examples of empires swallowing up entire nations using commercial trade, re-education, cultural assimilation and other methods that Baru observes as her home’s identity is gradually chipped away. Possessing a sharp intelligence and an eye for hidden designs below the surface, she grows up within the enemy’s system, outwardly embracing their ways while secretly biding her time in patience until she can exact her revenge. Her talents have not gone unnoticed. As one of the Masquerade’s most promising young graduates, Baru is posted to a distant nation which has proven to be the ruin of anyone foolish enough to attempt to tame it. Socially, politically, economically, the land of Aurdwynn is a mess, an unruly quagmire of mercurial dukes and treacherous bureaucrats, the population teetering on the brink of rebellion. With little knowledge of the local ways or customs, Baru is nonetheless tasked to bring order to the chaos as Aurdwynn’s newest imperial accountant—another test from the almighty Masquerade. Oh Baru, Baru, Baru. How I adored Baru. Some characters just have this way of getting under your skin. I doubt Baru and I would have gotten along in real life; she is simply too formal, too distant, and too devious for my liking. She also has this tendency to see everything in terms of pros and cons, gains and losses, and to prioritize final results above all else, which is the complete opposite of my personality. But somehow, she really worked for me as this book’s protagonist. By all rights she should have frustrated me to no end or bored me to tears, and yet I found a lot to like about her past that cold, calculating mind. So much of the story is driven by Baru; she’s what made it so fascinating. I was drawn to her strange and unique persona, and found myself enthralled with experiencing everything through the eyes of someone who’s a mystery to me, someone who I also really wanted to understand. Still, I’m not going to lie; there were definitely moments where I struggled, especially throughout the middle part of this book. I did what I feared and became bogged down by the minutiae of economics and then became frustrated when I just couldn’t keep up. Whether she was navigating the sticky politics of Aurdwynn or helping to organize a rebellion, Baru seemed to relish in tackling everything the same way: like she’s running a business. Which I suppose is how her character’s mind works, with an eye for the bottom line, but it certainly didn’t help make reading this book any easier. Who knows though, you might find yourself really taking to the financial politics, revenue discussions, and the balancing of surpluses against deficits, but if you’re like me and find your attention flagging over some of the details, all I can say is try to persevere and try not to lose sight of the big picture. The best has yet to come. Which brings me to Tain Hu, Aurdwynn’s rebel duchess of Vultjag. From the moment she uttered the words “My Lady, command me” I was in her spell. There are so many ways I can describe the relationship between Baru and Tain Hu and how I feel about the two of them. Exhilarating, complicated, exquisite. Touching, dangerous, heart-wrenching. And yet none of these words seem quite adequate. The beauty of their connection defies all description. There is simply nothing I can compare it to. Their story is one for the ages, and I loved every moment they were on the page together. This is a book you can really lose yourself in. As conflicted as I was about Baru’s character, I did very much want to see her succeed. I just didn’t know the costs. I didn’t realize how deep I was in, until it was too late. 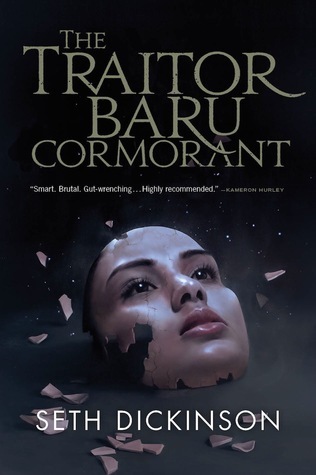 Sure, The Traitor Baru Cormorant might not have been the easiest read, but I have to give it credit where it counts. As I’m sitting here with this tight, clenching feeling at the pit of my stomach, trying not to scream, I can’t help but think, well, a book that makes me feel like this has to mean something, right? I didn’t love everything about the book, but no doubt about it, I loved everything it made me feel. OMG I was totally gutted. Days later, I’m still feeling gutted now. I know, isn’t it so funny how we readers love getting these visceral reactions out of our books, even when it hurts so much!? Damn, I think I’m going to have to read this one. I like the sound of it. From what I see on Goodreads and other places, it seems like a book you either love or hate. I’d be very interested to see your reactions. Yeah, I totally understand everything you say in this review! It is a pretty brutal book. The story did catch my interest. I hope you’ll get to check it out! Great review and totally feel everything you say. The middle was where I sagged a little. And, ohhh, Tain!!! Say it with me, TAAAAAINNNN HUUUUUUUU!!!! And yeah that ending totally destroyed me. The idea of economic and accounting does sounds dull, but I did love The Folding Knife, which is 100% about banking, so I’m willing to give this one a shot. When I first saw this book, I actually wasn’t interested at all. But then, when it seemed the like internet almost blew up with this book everywhere, I started to give it a decided to give it a second glance. At the signing with Seth, I told him that I been reading reviews for his book and to basically sum up most of them, they all the said ending was “emotions”. He just kind of laughed and said Yeah… you’ll understand when you read it. I was sort of the opposite, I was REALLY excited to read this book and then the mixed reactions started coming in and I became somewhat reluctant to tackle this. But I’m glad I did. So good. And yes, re: the ending, you’ll definitely understand why! I love/hate when authors introduce you to a character as a child. I get over attached. Like you, I was of two minds about this book because even the most glowing reviews warned potential readers about the same elements that worried you. So I waited before adding this title to my list. I’m afraid to read this after book that review. Very afraid. And naturally I mean read this *book* after *that* review… my brain is fried today! Doooo eeeeeet! Just be prepared to get gut-punched. I had seen a lot of negative reviews for this one. I’m glad to hear a positive one now. I’m not sure it would be something I’d like with all the math and economical references, but you have made me curious. Might give this a chance when I have more time! The reviews I’ve seen have been either one way or the other, there doesn’t seem to be much middle ground. At first I thought I’d be in the middle, but I ended up loving it! I’ve just come to this because your review for the second book says not to read it until I’ve read the first book and that it was one of your favourite books of the year, and I missed your review. You didn’t need to know any of that really, did you?